The surrounds of Orvay lend themselves to dramatic flair. 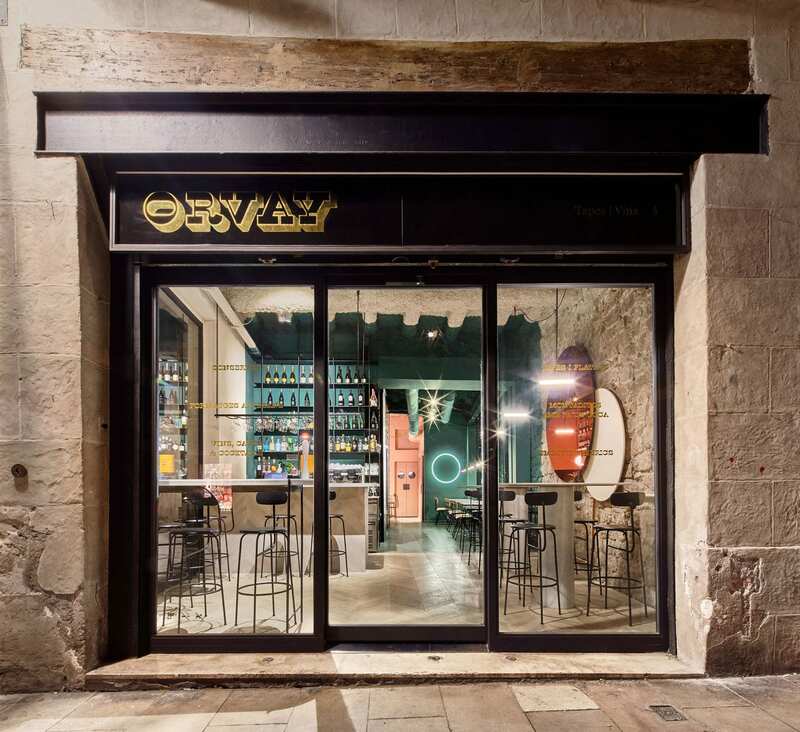 The wine bar is set in front of the Santa Maria del Mar, one of Barcelona’s most emblematic 14th Century Gothic churches. 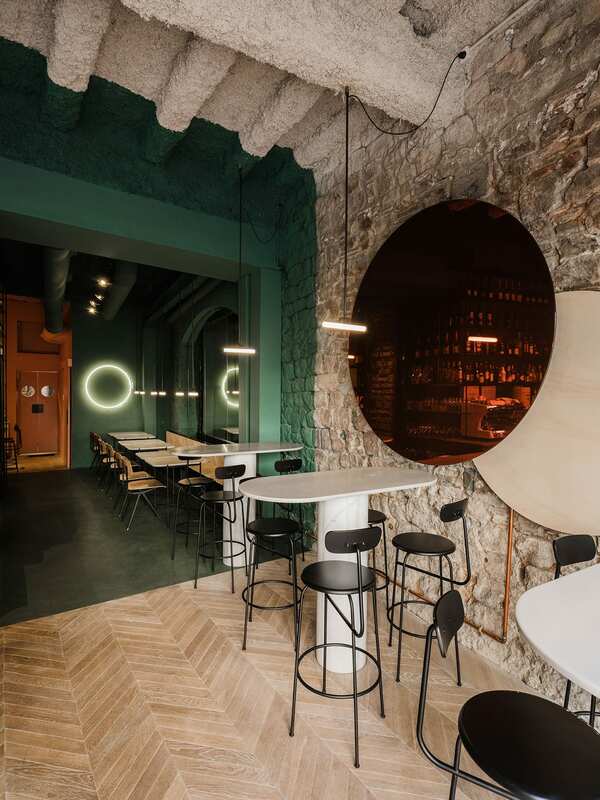 The interiors follow suit, with the art of winemaking serving as the inspiration behind Isern Serra and Sylvain Carlet’s design. 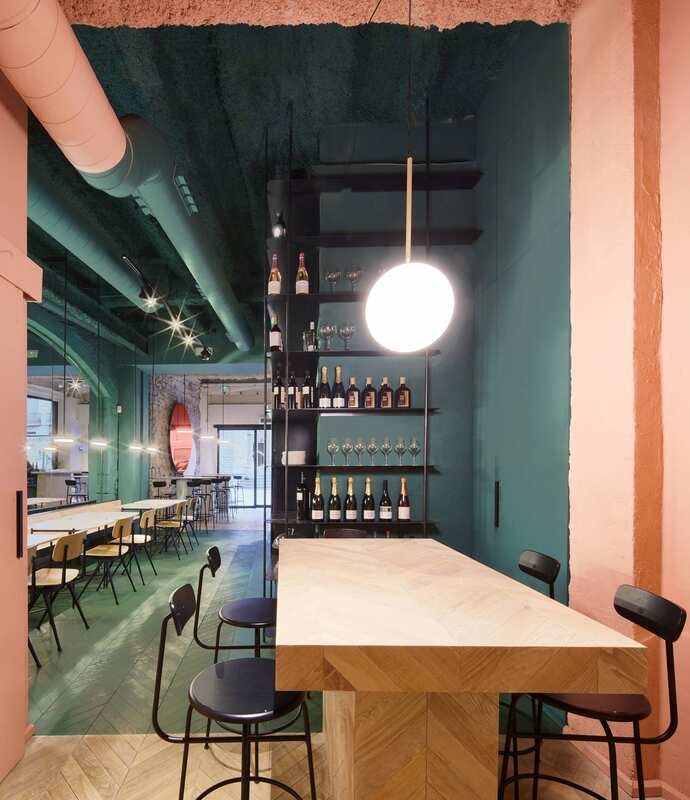 Colours of the land, vine, and grape are at the fore, the contrasting shades used to denote three various seating sections. 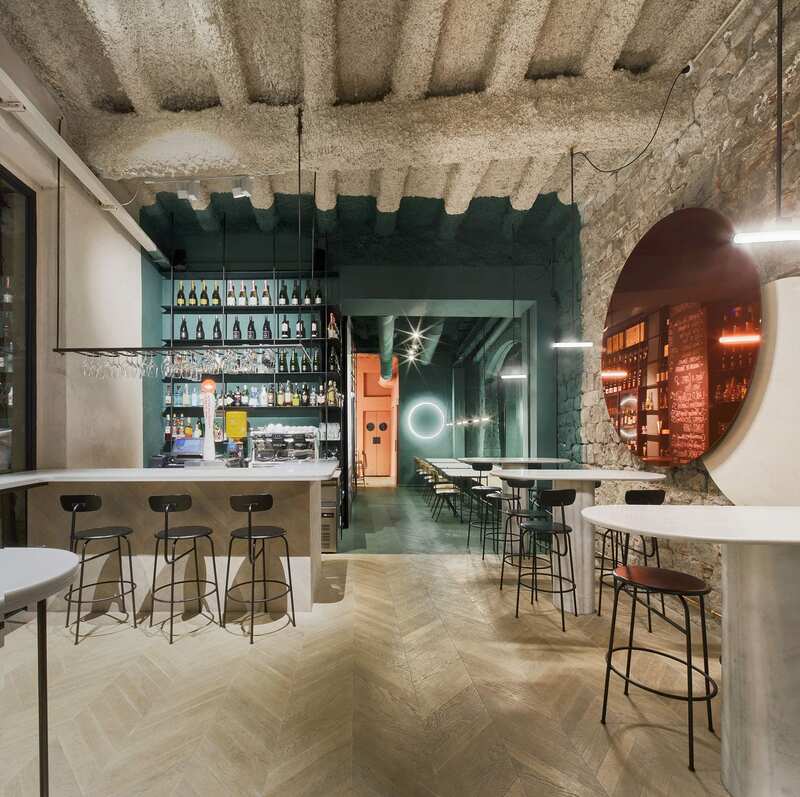 In the entrance bar, rounded white marble high tops give a sculptural contrast to the building’s medieval bones. 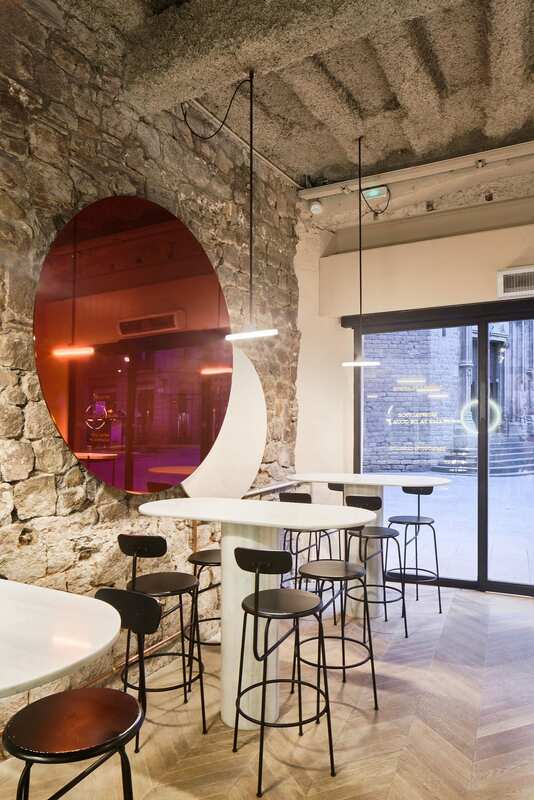 Serra and Carlet knocked through a false ceiling to reveal historic arches and stone walls. The natural, earthy tone represents the Denomination of Origin, the official geography used to identify the land on which grapes for different wines are grown. 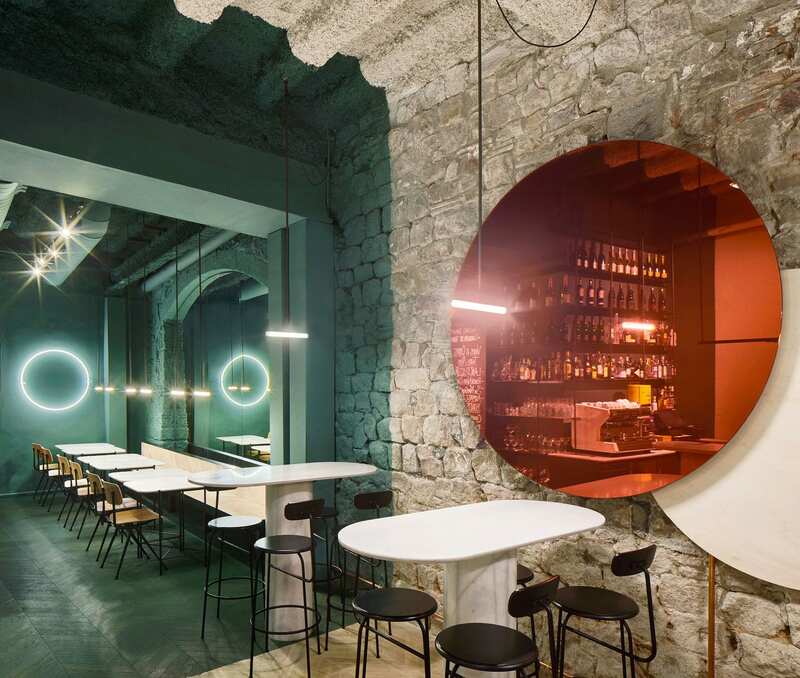 The reflection of a round, merlot-hued central mirror is meant to give the effect of looking through a glass of red wine. 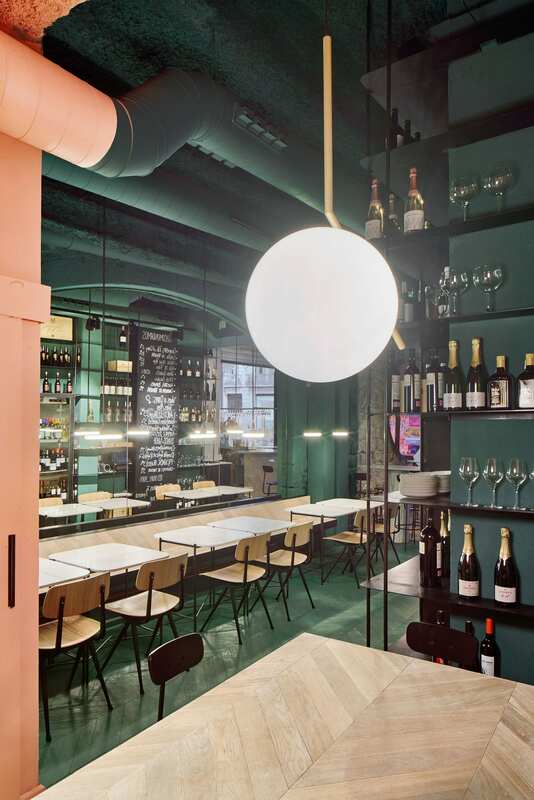 This leads through to the metaphorical vineyard; a more formal dining section with walls, ceiling, and floor seamlessly painted in the same deep shade of vine-green. 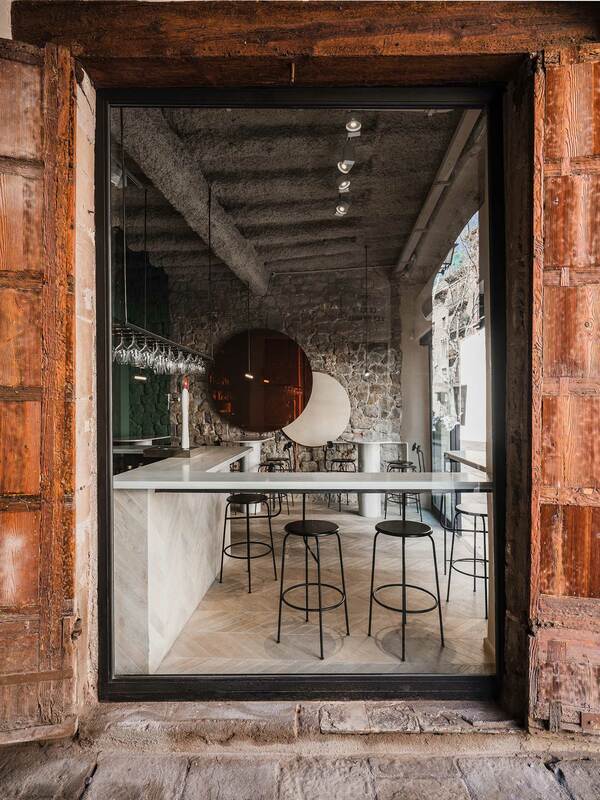 A black steel wine rack houses some of Spain’s best bottles, and two-person marble tables are unified by a natural oak bench that runs the length of the wall. 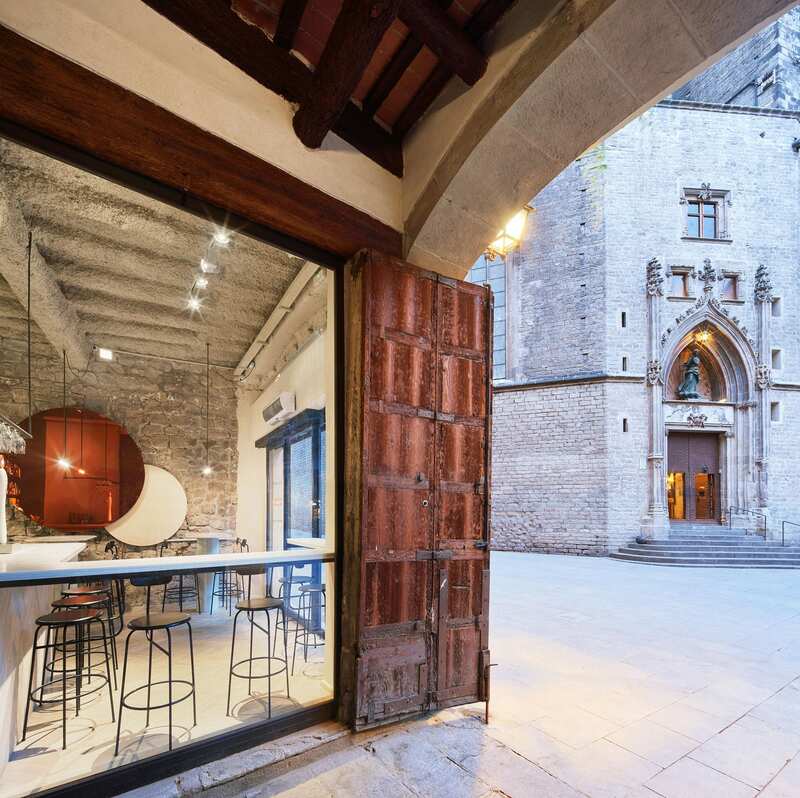 A large mirror fills a pre-existing medieval arch, expanding the space. The back dining room, reserved for large groups, is painted pink in honour of a winemaker’s essential ingredient, the humble grape. 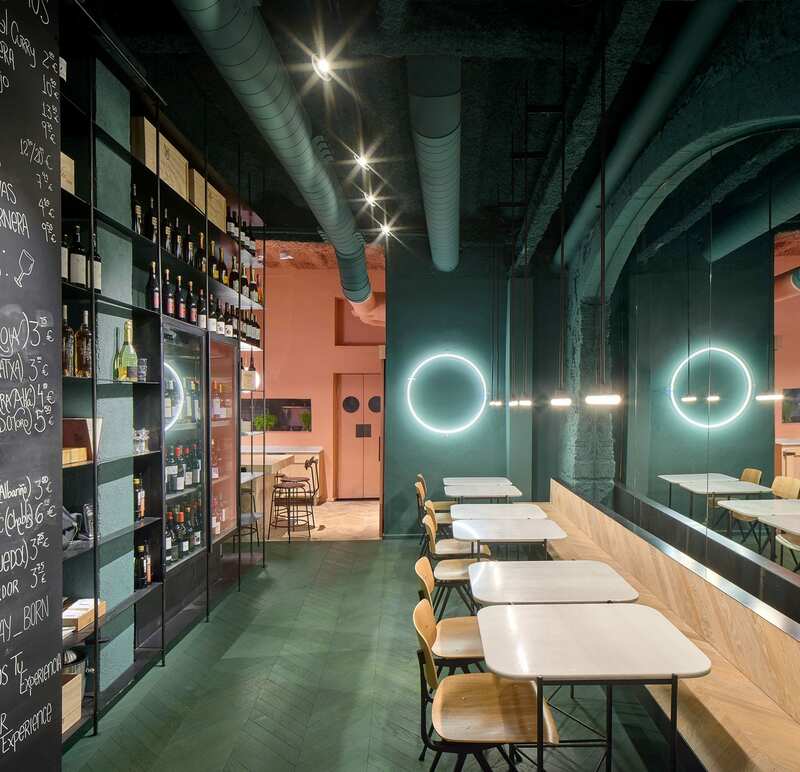 Lighting plays a key role in enhancing, but not overwhelming, the bold colour palette. Serra and Carlet are particularly inspired by the “simple geometries” of straight lines and spheres in their work. 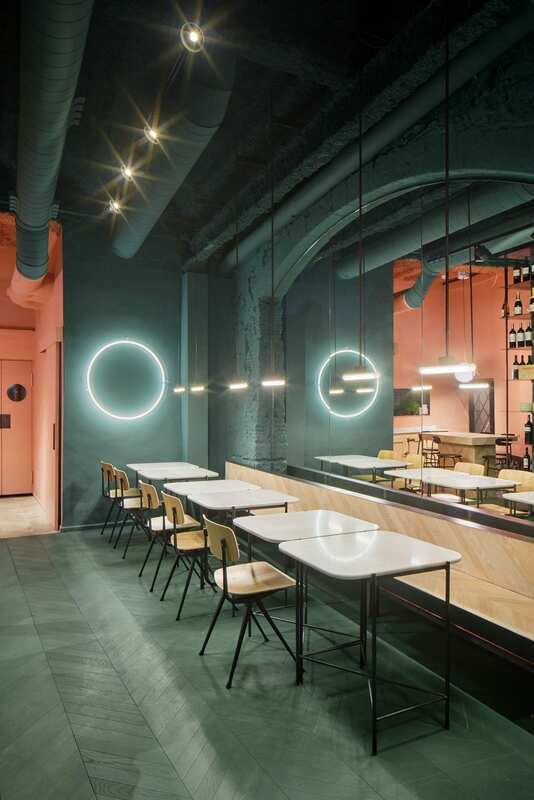 Linestra LED lights hang throughout the space, while an Anastassiades for Flos lamp takes precedence over the communal dining table.